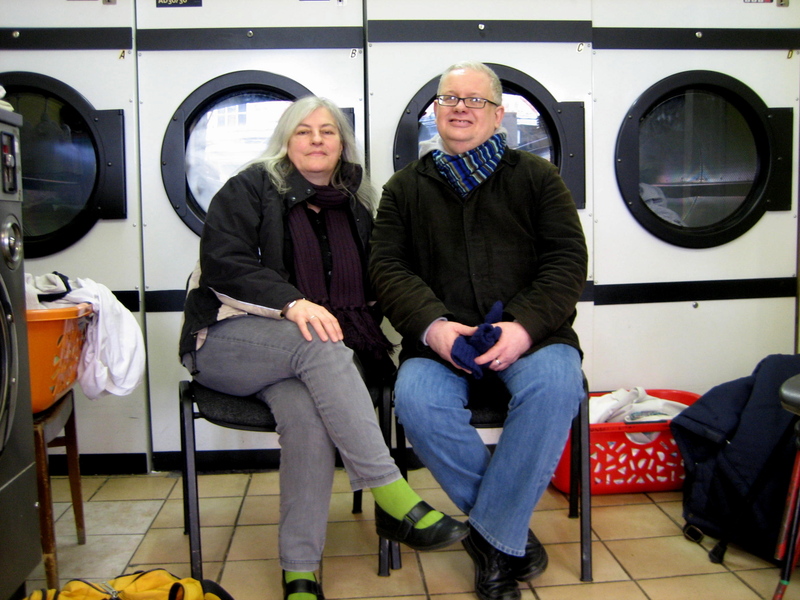 “We see each other three or four times every week to hand over the keys of the launderette, but in spite of this we have developed a solid bond of friendship,” quipped Philip Green affectionately, speaking of his fellow Director of the Boundary Estate Community Launderette, the equable Jean Locker. Both live here on the magnificent Estate, built as the first social housing in Britain and are justifiably proud of their launderette, nestling in Calvert Avenue opposite Leila’s Shop next to Arnold Circus – as they explained to me when I met the two community champions yesterday, for a conference amid the washers and driers, while the customers negotiated around us to manoeuvre their washing in and out of the machines, that churned and rattled as we spoke. “We needed a launderette”, explained Jean, “And a lot of people came together to develop the idea of a co-operative to run a launderette as a social enterprise in the community.” She told me it took two years of hard work to raise enough money and negotiate the lease, before they could open in September 1992, at a time when most of the other shops in Calvert Avenue were derelict and many of the flats in Arnold Circus were boarded up. But the launderette immediately proved triumphant, not just for laundry but as a vital community centre and symbol of renewal too. Today, hundreds bring their washing each week to the four employees, who also provide a service to many local businesses and, in particular, to the Shoreditch Football Team – who deliver their muddy kit after every game, including their ball in the bag to get it scrubbed up ready for the next fixture. Although the beautiful launderette has been a storming success for nearly twenty years now, washing clothes only covers running costs. Whenever maintenance is required funding has to be raised elsewhere, because the co-operative is without any financial reserves. “What comes in, goes out!” said Jean, referring not only to the laundry but also the co-operative’s bank account too. As we spoke, one washer was out of action until money for its repair can be found. Passionate advocates, Phil and Jean spend fifteen hours every week writing letters applying for grants from charities to cover the necessary additional expenses. This is on top of sharing the duties of locking up each night. “It’s been hard, it’s not been easy,” admitted Jean, revealing that, after the first ten years, the machines began to pack up and they raised £15,000 to replace them all. She and Phil are the only active directors of the original twelve now (apart from Anita who does the accounts) and Jean confided that she gives up a day each week of her salaried job, to do the unpaid work required to keep the launderette open. They both agreed that some younger directors of the co-operative would be welcomed. I realised I was in the company of a pair of unsung benefactors, Jean with her bold features and clear-eyed sense of social responsibility and Phil, a kind man with a self-deprecating laugh. They put in all this work just so that everyone has a launderette. Jean told me she always volunteered, “You do it because you live locally and after twenty years here, people rely on us – including the people who work in the launderette. You can’t pull the plug on that.” Phil agreed “I love the estate, I have a lot friends here and I believe things that are needed must be kept.” I was touched by the nobility of these thoughts in such a modest location, but as I cast my eyes around at the brass plaques listing grants given and awards won, the results of their ideals were self-evident. 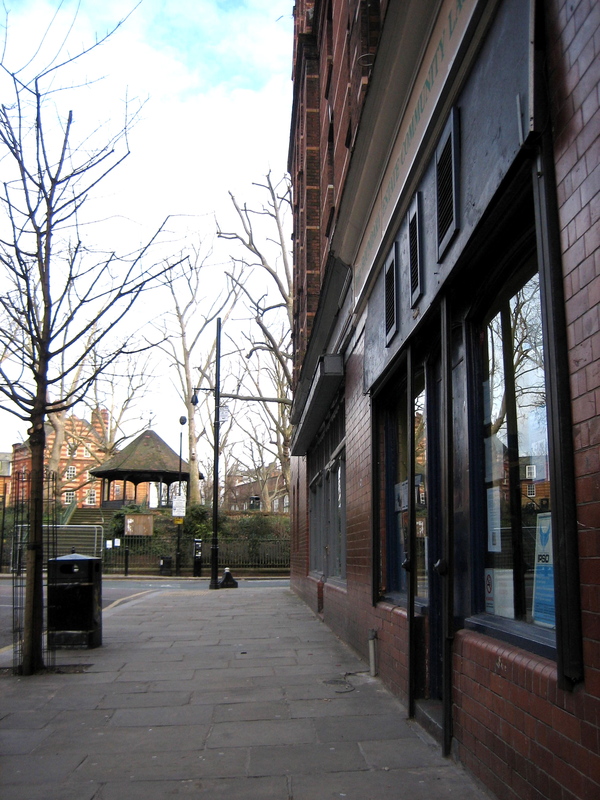 Everyone loves the beautiful community launderette at Arnold Circus. As we talked, there was another individual I wanted to speak with, whom I observed preoccupied with carrying baskets of laundry around, and loading and unloading machines. 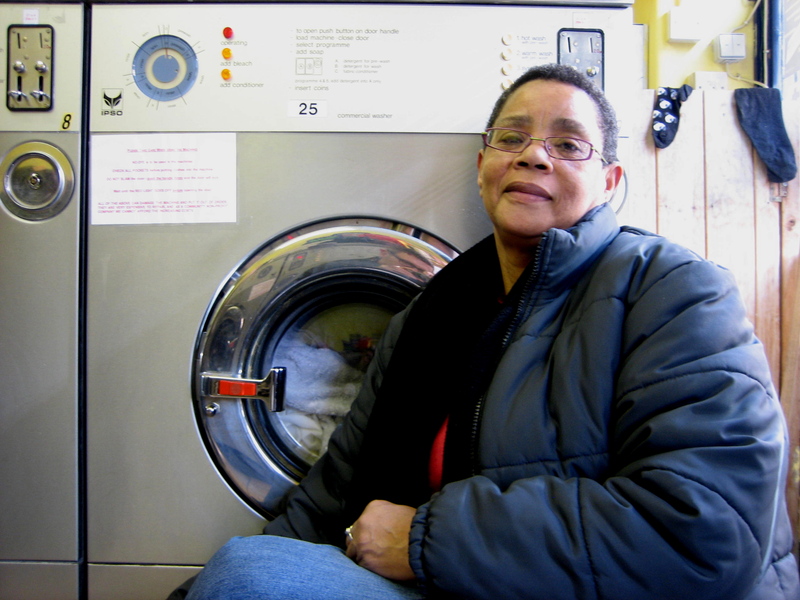 Marie Glace has been the manageress of the launderette since 1992, she has been here, day in day out, over all these years, becoming a popular and respected local figure in the process. I am reliably informed that she is a confidante to many people here when they require a trusted counsellor. Eventually, I managed to pull up a chair next to her, and we sat together enjoying the warmth of a washing machine in its hot cycle, sheltered from the icy drafts by the bookshelf that holds the launderette’s free lending library. At once, I was spellbound by Marie’s gentle features and soft voice that draws you closer to listen. “I get everybody organised, make sure things run smoothly and deal with complaints. I know everyone round here.” she disclosed, “We’ve had a few dramas when someone’s clothes all got dyed red by accident and they blamed me for it – but the people are alright because everybody’s friendly on the whole. It’s nice to have a community to be part of. The elderly people come, they don’t see anyone all day, so they just bring a few things to wash and have a chat. We make coffee for them and maybe give them a biscuit.” This is the woman who really knows everything that goes on in Arnold Circus, I realised, as she went on to tell me about the married couple whose romance first blossomed over the spin-dry. The Boundary Estate Community Launderette was the initiative at the beginning of the renewal of the neighbourhood twenty years ago and it is an enterprise that is true to the spirit of those who first built Arnold Circus. Now we must ensure that the beautiful launderette continues to exist and thrive as a necessary democratic temple where everyone can meet as equals over wash and tumble-dry. 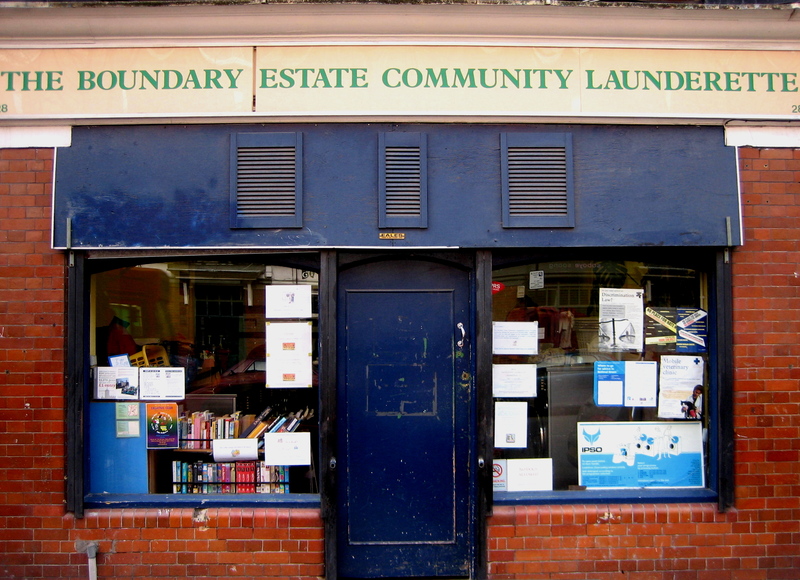 If you want to show your support for the Boundary Estate Community Launderette click here to go to their facebook page. Great to see this publicity for the laundrette, which I have used several times recently and found really friendly and helpful. More strength to it. Surely the rumours I hear about a greedy Council wanting to up its rent AND take a cut of its turnover can’t be true? How can they justify that? I really hope that the council will stop behaving in this nonsensical way and leave the launderette alone. Haven’t they got better – more important – issues to deal with at the moment? Or are they determined to be small minded and ungenerous as usual? We will finally be able to let everyone know the outcome of our rent neogotiations with the council within the next ten days. When we know the council’s decision we will have to discuss matters as directors, and then with the staff. Once we’ve done that we will let you all know. It’s something you’re probably fed-up of hearing from us by now, but please suggest our facebook page to your facebook friends. It really could make a huge difference should we find that we may need to start a campaign. And if we don’t need to start a campaign it’s always good to be a fan of something a bit different that does some good – there aren’t many not-for-profit community launderettes around! BBC Radio 4 have a programme called ‘Saturday Live’, which is a magazine programme that covers all aspects of life in the UK today, and – surprise, surprise – it is on every Saturday at 9am. They will be doing a feature on the launderette in the near future, we’ll let you know the date as soon as we have it. Enjoy your Bank Holiday Monday, if you’re lucky enough not to be working! We’re pleased to say that the future of the launderette is guaranteed, we’ve agreed a new five year lease with Tower Hamlets, although we’ve had a huge rent increase. We can now plan ahead – we’ve even got ourselves a web page! As well as info on the launderette we’ve posted pages on local history, and each week we provide info on local events. We hope to regularly post new pages on items of local interest. Let us know what you think – you can even subscribe! The Boundary Community Launderette Team. I was thinking of setting up a similar project in a northern town (Liverpool or Newcastle-upon-Tyne. Also I wanted to include a lending library/community cafe/wi-fi etc. What do you think please of the idea of using regular domestic washers to save on initial outlay? How long do you think they would hold-up? Look forward to hearing from you and good luck with your community launderette.